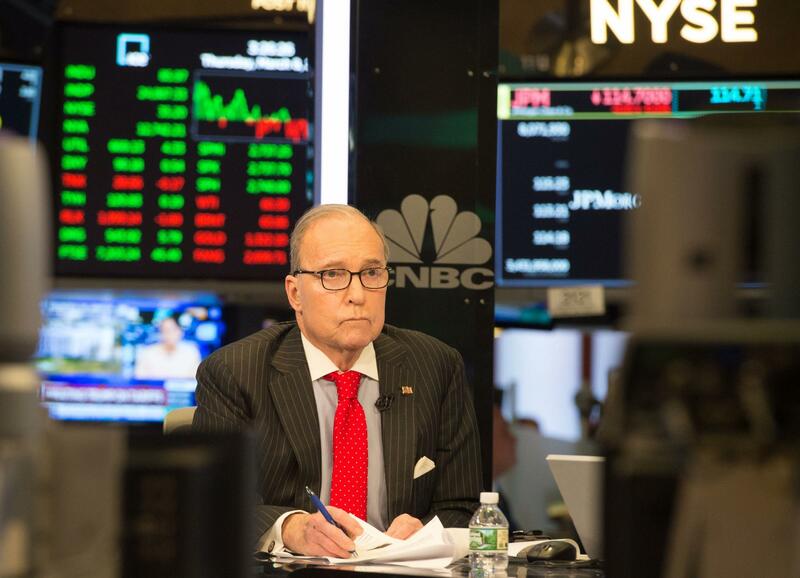 Conservative commentator and economic analyst Larry Kudlow speaks on CNBC's set at the New York Stock Exchange on March 8. President Trump has picked economist and CNBC commentator Larry Kudlow as director of the White House National Economic Council, and Kudlow has accepted the post, the White House said Wednesday. Kudlow, 70, will replace Gary Cohn, who stepped down after losing a battle against imposing tariffs on steel and aluminum imports. "Larry Kudlow was offered, and accepted, the position of Assistant to the President for Economic Policy and Director of the National Economic Council," White House press secretary Sarah Sanders said. "We will work to have an orderly transition and will keep everyone posted on the timing of him officially assuming the role." A longtime free-markets conservative who worked on Wall Street, Kudlow supports most traditional Republican fiscal policies, which may quiet concerns among congressional Republicans and investors that the president will surround himself with trade protectionists. Kudlow has known Trump for years and advised him on policy matters during the 2016 campaign. He largely supports the president's agenda and has been a big advocate of his tax cuts. "Trump and the GOP are on the side of the growth angels with the passage of powerful tax-cut legislation to boost business investment, wages, and take-home family pay," Kudlow wrote after the Republican tax bill passed in December. But he has criticized Trump's trade policies. For example, he recently said any move to withdraw from the North American Free Trade Agreement would be a "calamitously bad decision." Like Cohn, he also opposed the steel and aluminum tariffs announced earlier this month, telling CNBC: "In the Reagan years, we used to call the free traders the 'white hats' and the protectionists the 'black hats.' The black hats won this time around and I'm very sorry, because it will damage the economy to some extent." Kudlow told The Wall Street Journal he had voiced his concerns to the president and was encouraged by Trump's decision to exempt Canada, Mexico and Australia from the tariffs. "He said to me several times, 'I believe in global trade. I regard myself as a global trader, but it has to be fair trade to protect America,' " Kudlow told the Journal. "I'm on board with that. I personally hope widespread tariff use — it doesn't come to that. But in some cases, it will." On his recent podcast, Kudlow noted: "Mr. Trump has a negotiating style that is very interesting to me. He comes at you — like he's going to punch you in the teeth with all these tariffs. But then he pulls back and starts making, you know, negotiating deals that can work. That looks to me like, you know, that's his art of the deal. It's in his book. That looks to me like what he's doing here on tariffs. He comes out really hard and strong. Scares everybody. But then he starts to pull back and withdraw." Kudlow does not have an economics degree. After serving in the White House Office of Management and Budget under President Ronald Reagan, he was hired as chief economist at Bear Stearns. But he was forced out amid struggles with drug use, a problem he has spoken about publicly. Since then he has been a regular commentator and host on CNBC and has written often on economic matters. But he was criticized for repeatedly downplaying the economy's troubles in the months leading up to the Great Recession. "There ain't no recession," he wrote in December 2007. "The Bush boom is alive and well." Kudlow also warned that subsequent Federal Reserve policies aimed at stimulating the economy would lead to higher inflation, which didn't happen.